CareerCast.com has compiled a list of the top jobs where a four-year college degree is not required. The careers in this list are varied – from dental hygienist to web developer, electrician to administrative assistant – so there is potential for all skillsets and personality types. 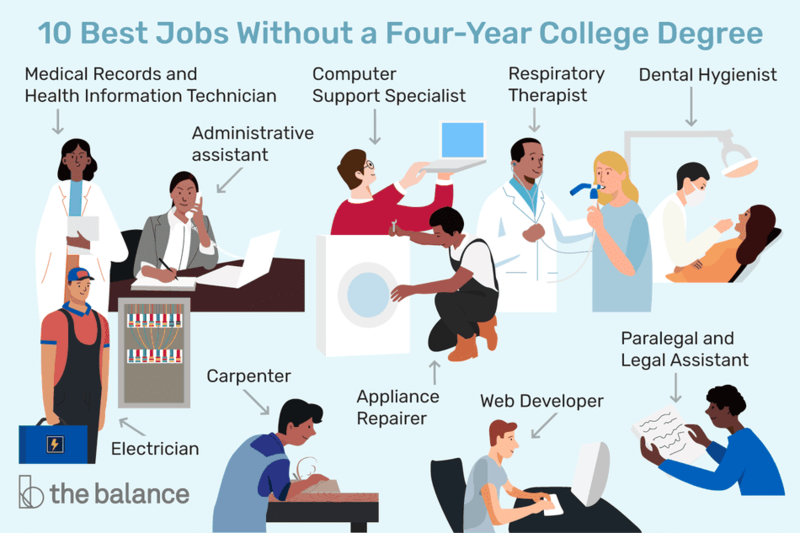 Some of the jobs may require an associate's degree, certification, or training, but they are jobs that pay a decent wage and have good earning potential. With others, you may be able to get on-the-job training or even be self-taught. In some cases, you may be able to get hired by meeting the experience requirements even if you don't have a degree. Explore these leading jobs and consider them as you investigate your career options. There are great options available for everyone, and you don't necessarily need to start by going down the traditional college route. Administrative assistants provide administrative support that includes conducting research, preparing reports, and handling information requests. They may also arrange conference calls, webinars, meetings, and events for the company. Administrative assistants may provide support to just one person in an office. More frequently, they support an entire department or team within a company. A high school education or equivalent is generally required for this position. Individuals with strong communication skills and organizational abilities are best suited for the role. Job Outlook: Declining. The Bureau of Labor Statistics expects a 5% decrease in jobs by 2026. When you have appliances, they break. Depending on the season, it's tough to be without air conditioning or heat, which helps put repair technicians on the “top jobs” lists. Heating, air conditioning, and refrigeration mechanics and installers (referred to as HVAC or HVACR technicians) work on heating, ventilation, cooling, and refrigeration systems that control the air quality in many types of buildings. An apprenticeship or non-degree post-secondary school education is often required for HVAC technicians. Good mechanical skills and an ability to troubleshoot and solve problems independently go a long way in this job. Job Outlook: Declining. The Bureau of Labor Statistics expects an 4% decrease in jobs for maintenance and repair workers by 2026. Carpenters make repairs, as well as cut, build, and install furniture, structures, and framework. Carpenters can work outside (e.g., building a bridge) or work inside (e.g. installing cabinets or repairing stair rails). Because of the equipment used, such as saws and ladders, the job is not without danger. While some carpenters learn on the job, many receive a formal apprenticeship. Apprenticeships consist of at least 144 hours of technical training and 2,000 hours of on-the-job training. After years of experience, many carpenters choose to be independent and run their own business as well. Either way, this is a good opportunity for self-starters who enjoy working with tools. With the construction industry booming, the Bureau of Labor Statistics anticipates a great deal of demand for carpenters. Job Outlook: Average. The Bureau of Labor Statistics expects an 8% increase in jobs by 2026. Computer support specialists (also known as computer service technicians) help and advise people and offices with computer software and equipment. In this role, you are responsible for figuring out a variety of information technology (IT) issues like why the Wi-Fi isn't working or why emails won't go through. Computer service technicians need to have a strong technical know-how, patience, and excellent communication skills. An ability to figure out a problem quickly and efficiently is also good to have. An associate's degree is often sufficient for this position, although sometimes a high school diploma will suffice with the right skills. These jobs can have either traditional 9 to 5 hours or require working late nights, early mornings, and weekends. Job Outlook: Above average. The Bureau of Labor Statistics expects a 11% increase in jobs by 2026. Dental hygienists don't need a four-year college degree, but they do typically need an associate’s degree in dental hygiene. Every state requires dental hygienists to be certified as well. Given the nature of the job, hygienists should have strong communication skills and be willing to work very closely with all types of people (and teeth). An attention to detail and a caring touch is also important because many patients fear dental work. Job Outlook: Much faster than average. The Bureau of Labor Statistics expects a 20% increase in jobs from by 2026. From factories to offices to homes, electricians are in charge of supplying power to our world. They install and maintain electricity, lighting, and communication systems for a variety of industries and needs. Electricians can be employed in jobs that are indoors or outdoors, or both. They may also be asked to cover emergency situations and be on call regularly. As well as training programs offered at vocational schools, electricians typically have an on-the-job apprenticeship. Attention to detail, a steady hand and the ability to troubleshoot problems are good skills to bring to this job. Job Outlook: Average. The Bureau of Labor Statistics expects a 9% increase in jobs by 2026. The still booming health industry means that medical records and health information technicians are in demand. With the same growth outlook as dental hygienists, becoming a medical records technician is a good job choice if you're interested in the health field, but would prefer less hands-on work and less direct interaction with patients. Medical records technicians ensure that patients' files are up-to-date and accurately coded for insurance billing. They manage healthcare information on computers and on paper, ensuring its accuracy. An associate's degree or certification is required for this position. Strong organizational skills and an extreme attention to detail are good qualities to have in this field. Job Outlook: Above average. The Bureau of Labor Statistics expects a 13% increase in jobs by 2026. Paralegals and legal assistants do a variety of work to support lawyers, including maintaining and organizing files, conducting legal research, and drafting documents. An associate’s degree or a certificate in paralegal studies is typically required for entry-level candidates. If you have excellent communication skills, are detail-oriented and enjoy an ever-changing and always challenging work environment, a paralegal career may be a good choice. Job Outlook: Above average. The Bureau of Labor Statistics expects a 15% increase in jobs by 2026. Helping people who struggle to breath is important, and it can be fulfilling work. As a respiratory therapist, you can give comfort to young and old patients with asthma, emphysema or other ailments that make breathing difficult. Respiratory therapists work in hospitals – from the ER to pediatrics – as well as nursing homes and some also make home visits. It is a job that requires technical knowledge, a caring touch, and compassion. Training and certification are required for respiratory therapists, and an associate's degree is often part of those requirements. It is minimal training in comparison to other careers in the health industry, and it can be just as rewarding. Job Outlook: Above average. The Bureau of Labor Statistics expects a 23% increase in jobs by 2026. Web developers design, develop, and maintain websites. Some web developers are self-employed, working for a variety of companies and individuals. Others work in computer systems design, information services, finance, or education for large and small companies. This is a good career choice for individuals who are both technical and creative and if one of those is not your strong suit, you can concentrate on the other. Web developers are needed for various projects and many become specialists in a few specific skills with a general understanding. Web developers typically need an associate’s degree in web design or a related field, such as programming or graphic design. Be ready to continue learning throughout your career because technology changes fast and you need to keep up with the latest trends on the web.